August 19th, 2012 at 12:02 pm These guys are always a pleasure to see. Boom & Gary of the Vermilon River, Canada. August 19th, 2012 at 12:07 pm A lovely bird! August 19th, 2012 at 1:30 pm ….that image was taken through a window? Wow….it’s such a photo of clarity tho. And the grosbeak is pretty, isn’t he? I guess I should say, “handsome”….guys just aren’t pretty…they’re handsome. Thanks for linking up this week at the Bird D’Pot. 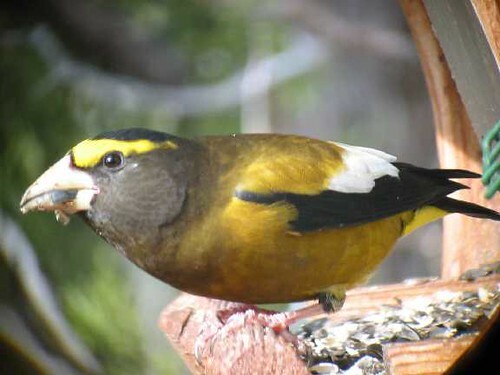 August 19th, 2012 at 1:44 pm The evening grosbeak is gorgeous. August 19th, 2012 at 3:38 pm Wonderful photo and the coloring on this bird is really pretty. August 19th, 2012 at 5:52 pm Nice bird!!! August 20th, 2012 at 4:40 am Amazing capture. I agree, I could only hope to get this good of a shot with my camera. Most of my bird pictures are blurry and hard to see. Occasionally I get a keeper, but most are deleted. August 20th, 2012 at 11:16 am I’ve never seen one of these in person. Beautiful bird! August 29th, 2012 at 4:06 pm Thanks for dropping by, everyone. Your kind comments are appreciated!